Advances in warfare usually are a result of a confluence of changes unfolding in economics, politics, technology and society. However the impact of warfare is more obvious because of its brutal nature while those of the other fields are more insidious. This is due to the pressing need to bring any warfare to a quick resolution resulting in intense and accelerated development and introduction of new weapons, strategies and tactics by all sides to the conflicts. Hence changes in the other fields can be foretold by looking at developments on the battlefields. Since the Peace of Westphalia in 1648 that ended the 30-year religious war between the Catholics and the Protestants, warfare took on a new dimension. After 1648, wars were being fought out by nation-states instead of tribes and cities. The root cause for the Thirty Years' War can be traced to the invention of printing in 1450 which in turn had been made feasible by the introduction of cheap paper. We have come full circle since then with the invention of the social media, allowing every one of us to broadcast our points of view to the whole world. Social media have also empowered protesters bent on bringing down governments. Much as the impact of the hard media was to lead to the rise of nation-states, the soft media's impact would herald the demise of nation-states. You can view the detailed explanations on the above modes or generations of warfare at Security XXI and Antiwar.com. Our main interest however is in finding out how warfare will emerge post-4GW, i.e., the 5GW, since this will also presage how the 5th Kondratieff wave will unfold. Our useful guide in this respect is a pattern that's been used for stock market trading, the Elliott Wave, which in turn is based on the Fibonacci numbers. The Fibonacci sequence of numbers is prevalent in the natural world where behind nature's seeming randomness, you can discover order and structure based on the Fibonacci numbers. 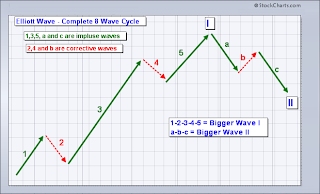 The Elliott Wave consists of 5 motive or impulse waves (coloured green on the left chart from StockCharts.com) and 3 corrective waves (coloured red). The motive waves drive man's progress in productive capacity. 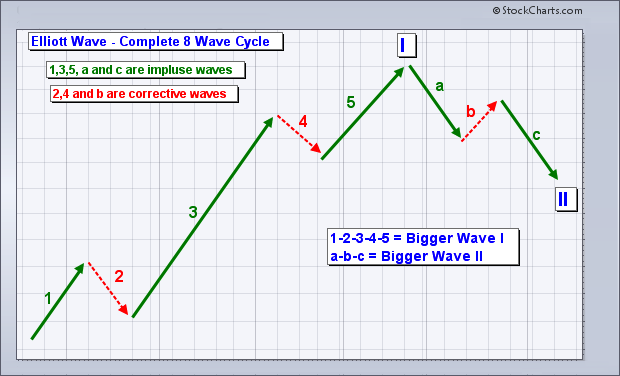 The first 3 green waves drive the pattern upward while the last 2 downward. Mapping this pattern onto the warfare pattern, we can deduce that the 1st 3 waves mark the growth of nation-states while the last 2 herald their demise. From 1 GW to 3GW, warfare was defined by state combatants. However after the fall of communism, states have retreated from wars between themselves because of the disappearance of one of the two major backers. But mankind's propensity towards conflict remains. Wars continue on a small scale with non-state actors, in the form of guerrilla bands fighting small wars against states. To be sure, guerrilla warfare has a long history; in fact as long as the history of mankind. But post-commmunism, non-state actors have been empowered in new ways, enabling them to capitalise on the weaknesses of state combatants. Moreover, in the past guerrilla movements relied on a plan issued from central command; nowadays they operate in cellular mode needing only a recipe instead of a plan. Several reasons can account for the rise of the non-state actors. First, the internet has allowed them to bypass the states' hold on information dissemination. The ability of each group to broadcast, or rather narrowcast, to its target audience makes for a fractured society. Second, state combatants have costs attached; every US soldier in Afghanistan costs $1m a year to maintain while that of the non-state group runs on a very minimal budget. Third, the failure of communism has provided room for the rise of religion and ethnicity as alternatives to capitalism, turning the clash from a conflict over ideology into a more passionate conflict over faith and culture. This is worsened by the recession which is morphing into a depression; the economy instead of being the glue that holds nation-states together will be the force that pulls them apart. Even homogeneous societies, such as the Arabs of Tunisia, Egypt, Yemen and Libya are sliding into turmoil mainly because of lack of jobs to keep their youths off the streets. The weakening of nation-states also will be somewhat hastened by the progress of the 5th Kondratieff wave. The advances expected of that wave will be in biotechnology and nanotechnology. The outcome will be cheap energy, materials and food, all produced by consumers for their own consumption, destroying the wealth accumulated in big manufacturing facilities. Design for the products will be available as open source blueprints the way open source codes are currently available for software. Nation-states also are no longer needed to provide the infrastructure and security for the distribution or circulation of such goods. Money which used to be the means of accumulating wealth may have passed its usefulness, making barter or precious metals as the medium of exchange. By the way, not much needs to be exchanged if you can produce your own goods and energy. Without exchange, nation-states won't be able to assess incomes for taxation. Weapons of destruction will come in new forms. As biotechnology advances, the cost of creating new types of viruses drops, easing the way for the development of biological weapons. Similarly, nanotechnology can facilitate the development of nano-sized toxic materials that can be easily dispersed in public places. With such ease, individuals can now act alone, dispensing with the need for group organisations to unleash chaos. A mild foretaste of this danger was demonstrated in the anthrax attacks in the US that began just one week after the 9/11 attacks. In the present 4th Kondratieff wave, we've also witnessed how Lulzsec and Anonymous mounted cyber attacks, all without the need for a formal organisation or central command. Each hacker knew what to do and had the tools to do it. That however was virtual yet the financial losses were immense, what more if the attacks were physical. 5GW therefore will emerge as warfare conducted by non-state actors most likely working as lone wolves. That'll be the ultimate combatant, reduced to one. To be sure, nation-states with their resources have made much progress in mechanising warfare through miniaturisation. In order to fight the non-state actors, war has to be cheapened by replacing humans with machines, such as unmanned vehicles and drones. Their prices have substantially declined as machines get miniaturised; the new $56,000 Raven drone price tag pales in comparison with the $5m Predator. Future drones can even be as small as bugs. A drone printed out by a 3D nylon laser sintering printer, has also successfully flown. However, such progress can turn against the innovators. There's nothing to stop any malicious individual from inventing his own drone to stake out his conspicuous opponents. Indeed the power doesn't lie in technology but in size as in future technology can be easily procured. A small size on the other hand confers stealthiness. The invisible has become invincible while the visible has turned vulnerable. Future battles no longer favour the big and strong but the small and weak. The world is changing too, the sooner the nation-states adapt to it, the less resources wasted on maintaining the status quo.